The Philippines offers a wide range of sights and experiences, from delicious cuisine to cliff-jumping and surfing. The 7,107 islands have different languages, culture, food, and experiences. But, if you have limited time and want to head straight to the best of the best, here’s our guide to the top 10 things to see and do in the Philippines. Manila is the country’s capital and one of Southeast Asia’s busiest and most colorful cities. Taste some delicious Filipino food at the fast-rising business center, Bonifacio Global City, in Taguig, the hip avenues of Poblacion in Makati City, or at the popular Ermita, where the booze and food overflow. Head to the bars in Quezon City or find cheap eats in Divisoria or Chinatown. Locals will show off their famous Filipino hospitality and help you with whatever you need. Some sites of interest you can visit in Manila are Intramuros, a historical “Walled City” built during Spanish colonization; Luneta Park, where a monument to the country’s national hero, Jose P. Rizal, stands; the National Musuem, where the country’s rich history and culture can be found in artifacts and works of arts; and entertainment hubs in Pasay City, where there are many resorts, casinos, and hotels. The Philippines has been colonized and occupied by the Japanese, Spanish, and Americans, and all left their mark on the country. To relive the history of the Spanish era, head to Intramuros and Vigan, Ilocos Sur. The streets and infrastructure has either been kept as it was or restored and renovated for visitors. Corregidor is a small island in Manila Bay and was the headquarters of the Filipinos during the Japanese occupation, from 1942 to 1945. Tour companies can arrange day trips to the island. In Bataan Province, to the west of Manila, Mt. Samat’s Dambana ng Kagitingan is another place to look back on the sacrifices of Filipinos during colonization. The shrine here was built to recognize the heroic deeds of Filipino fighters who participated in the historic Death March. Filipinos celebrate every single occasion in their lives by eating, and they also believe the best way to welcome a visitor is through the food! In Manila, find a local to accompany you to the bar-and club-filled Malate area to try the local ramen. Also check out the food parks in Marikina City and Quezon City. For truly unique Filipino food, travel through the archipelago. Taste Pangasinan’s giant bangus (milkfish), Cebu City’s famous lechon, or even Davao’s infamous durian. In Quezon Province, a couple of hours from Manila, try the raw meat kinilaw, suman (rice cake), tulingan (steamed fish), and pancit habhab, a type of noodle you eat with your hands. And don’t forget to end with a couple of shots of lambanog, or local wine. The Philippines is comprised of 7,000+ islands, many of which are yet to be discovered and named, and each with their own unique beauty. 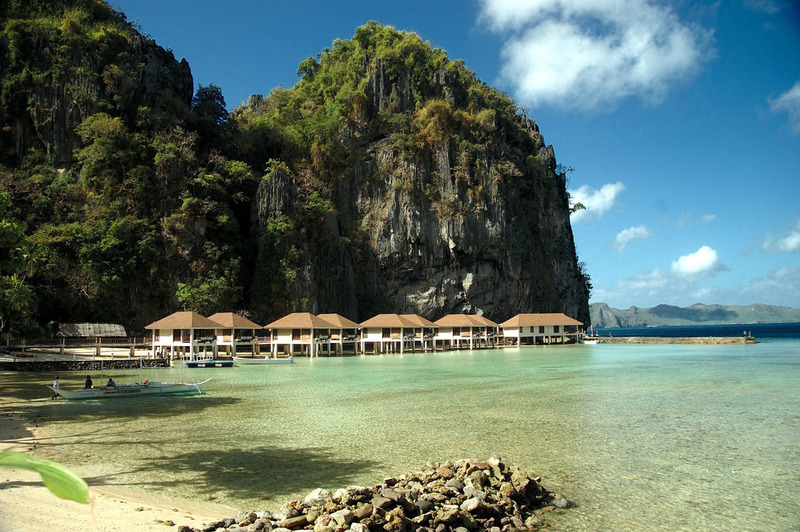 The most frequented islands to hop between are El Nido and Coron in Palawan. The limestone topography is stunning, with plenty of hidden caves to explore. Other great places for island-hopping include Cebu and the Bicol region’s Calaguas and Caramoan Group of Islands. Up north, Pangasinan’s Hundred Islands will definitely leave you in awe. Some of the major islands have resorts and activities to try, like snorkeling and zip-lining. You can also unleash your inner survivor by camping on a remote island. This is best done on the islands of Caramoan, located in Camarines Sur in the south, where a season of reality show Survivor was filmed. Tell your boatman to drop you off at Sabitang Laya Island or Matukad Island, and have him pick you up two or three days later. Just make sure you have enough supplies. These islands are uninhabited, but some vendors travel there daily to sell fresh juice to tourists. While island-hopping, why not try diving off a cliff? Boracay’s Magic Island, just a few minutes from Boat Station 3, offers this experience. Choose from boards at heights of 15, 20, or 30 meters. You can also go cliff-jumping in Nasugbu, Batangas on Fortune Island or on Davao’s Samal Island. Picturesque views from thousands of meters above sea level are easy to find in the Philippines. We suggest you try trekking Mt. Pulag, called the “Playground of the Gods” by locals. The clouds below seem to dance across the landscape from the summit. If you are looking for a quick day hike, Batangas (just south of Manila) is the place to go. Some of the most popular treks are Mt. Batulao, Mt. Maculot, and Mt. Manabu. Add excitement to trekking and see a volcano up close! Many tours are available to Mt. Mayon in Lagazpi, Albay. This volcano has been called the sister of Japan’s Mt. Fuji because of its similar distinct shape. In Tarlac, north of Manila, you can trek up to Mt. Pinatubo’s crater lake or take a 4×4 car up. About an hour from the crater lake, you can see a desert of ashes, from when the volcano erupted in 1992 and flooded many parts of Tarlac, Zambales, and Pampanga. Siargao Island is one of the best surfing spots in the world. The famous Cloud 9 reef break is considered the 8th best surf spot in the world and is recommended for advanced surfers only. If you are a beginner, head to Pundaquit, Zambales, Gubat, Sorsogon, or La Union instead. Diving allows you to see that the Philippines is as colorful underwater as it is above ground! Near Manila, a good weekend dive trip is to Anilao, Batangas. The conditions there are good year-round. If you are heading down south, Coron, Palawan, has interesting dive sites. In Coron Bay, there are WWII wrecks that make for interesting diving since they’re now teeming with diverse marine life. Also in Coron is the Barracuda Lake, where divers can see sharp thermoclines and interesting sea creatures. Legend has it that the lake is home to a large barracuda. There are a hundreds of festivals throughout the year in various parts of the Philippines. One of the most popular is the Sinulog Festival, a feast for Cebu’s patron Santo Nino. It’s held in January, and the highlight is a colorful dance parade. Another standout festival to visit is Baguio City’s Panagbenga Festival, a month-long flower festival.